As part of our preview season for Ixalan, we are going to take a deeper look at some of the cards previewed on our own homepage. Today, we'll be peering behind the scenes of the process that went into creating the design and art of Regisaur Alpha, which was previewed in my very own Card Preview article today! 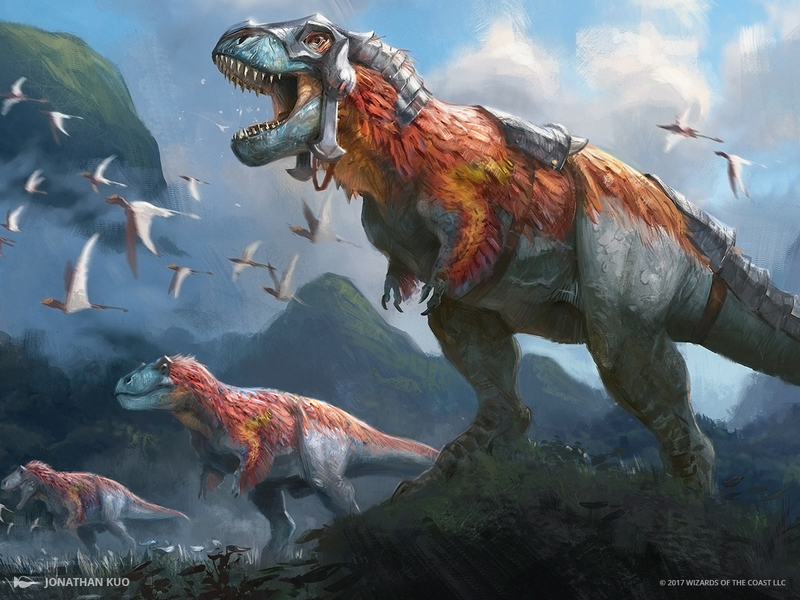 R&D knew early on that Dinosaur tribal was going to be popular, and they wanted to take the steps to ensure that it could be viable as a deck archetype across multiple formats. With this in mind, they designed Regisaur Alpha specifically to fill out the five-drop spot in the mana curve of a Dino deck and serve as the linchpin of the deck as a whole. Given the nature of Dinosaurs and how they fit with Magic design, the Dinosaur curve tends to round out a higher point than normal for many tribal decks, so the set team decided that five mana was a great spot for a splashy effect like this to live. This allows for some powerful follow-ups to be made at six mana and beyond. Action: Show a large predatory Dinosaur. It wears some armor, but has no saddle or rider. It is perched on a large fallen tree stretching diagonally across the scene. Behind it, we can see the rest of its Dinosaur pack—maybe one ducking under the fallen tree, maybe one coming around the other side. These might be partially obscured by tree trunks and undergrowth. Mood: Leader of the pack, together on the hunt. There were a few important features this art had to capture. One was that this apex predator was a part of the Sun Empire, but was still allowed to operate with independence, as seen by its metallic armor and lack of riding gear. Also important were the Dinosaurs in the background, as these represented the token-creation mechanic of the card. This Dinosaur is a natural leader, and while the members of its pack that it brings directly into battle may not be quite as powerful as their leader, they are still important.